...and both were prepared according to the same formula by the prominent think-tank, the Institute of Fiscal Studies. 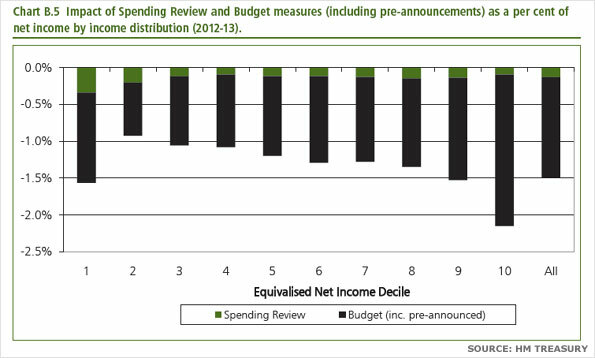 The first was given much weight by the Treasury during the Comprehensive Spending Review (full document pdf). The second was published as a slide to accompany the IFS' own post-CSR briefing (text pdf). As Sunder Katwala confirms it was the first time ever that the Treasury had published a distribution of spending annexe, but only after some urging from groups such as his own Fabian Society. The point of interest is the difference between the two: the official document omits the two lines indicating the totals as a proportion of income (white line) and as a proportion of expenditure (yellow line). 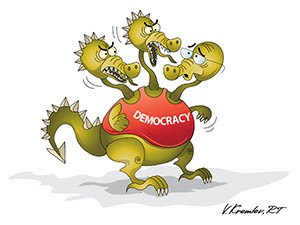 As we shall see below these illustrations are at the heart of a storm which encapsulates the whole debate over the current agenda of cuts dominating current politics and which provides the backdrop for the current parliament and the coalition government. When Chancellor George Osborne declared that the CSR "sets out a new vision of fairness for Britain," he determined that an acceptable definition of fairness now meant one which prioritises social mobility, on the grounds that "the existing system of support for the poorest has failed to deliver." During his speech he used the word 'fairness' 24 times. Socially-minded Trade Unions were quick to denounce this new definition, while economically-minded voices of business offered staunch resistance. Fairness has been the watchword of the LibDem contingent in the coalition government ('putting fairness at the heart of the LibDem manifesto', speech to conference announcing the £7bn 'fairness premium', email to party members following the CSR, ) and attacks on their definition of fairness have been a continuous theme of opposition to the coalition - as ConservativeHome's Tim Montgomery pointed out during the conference season the strategy is designed to get LibDems to pull out of the government, and force a neutered minority government to limp on or force a new election. Even local LibDem councillors are highly conscious that fairness is a dangerously subjective concept which allows Ed Miliband to practise divide-and-conquer tactics by focussing in remorselessly on individual policies. And in an influential article Julian Glover notes how "LibDems are making a poor job of defending themselves." Clearly Nick Clegg's party are vulnerable to this line of attack and Labour scent blood. But in one sense Mr Clegg handed his opponents a recipe for his destruction by setting fairness as a test for the coalition's implementation of the promised cuts in the spending review. Well he's certainly being tested now! 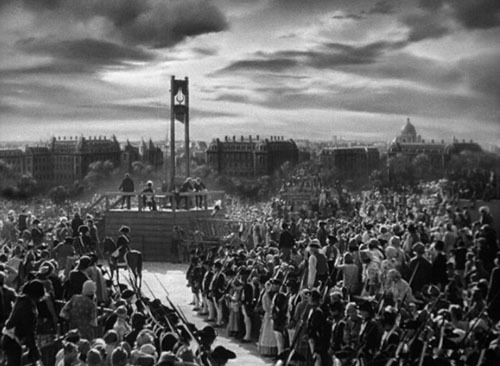 While strikes paralyse Paris and her provinces, in England the watchers wait and wonder where the chop will come. 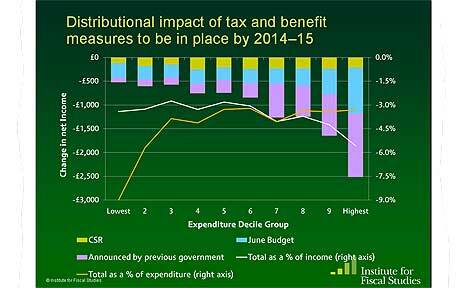 The Guardian was first to splash how 'the UK's most respected independent tax and spend monitor' IFS exposed a fairness gap in the spending review cuts during their post-CSR briefing, using the proffered graph as the prime illustration of their calculations. While admitting the difficulty in calculating accurately the full impact, acting IFS director Carl Emmerson announced unequivocally that the impact (as shown by the yellow line graph) was "regressive, not progressive," before prudently adding the rider (with which they would later absolve themselves) that this did not reflect on the fairness of the plan, since fairness is 'in the eye of the beholder'. But by then the dirty deed had been done and editors everywhere had written their prepared headlines. It was a call to arms. They intended to claim their latest victim and reassert the power of the press over a politician who had shut them out during 5 ravenous days of coalition discussions. Like a merry dance the press had been primed for this briefing session well in advance - they'd even had a practise run after the budget when Mr Clegg slammed the 'partial' IFS report against it. Guardian Liveblogger Andrew Sparrow even noted how there was a neat symmetry between the IFS briefing and a simultaneous joint Q&A session with David Cameron and Nick Clegg on the subject, bemoaning the lack of cameras at the IFS which would have enabled 24-hr news channels to show both on split-screens. And C4's economics editor Faisal Islam tweeted at the laughter in the IFS briefing which greeted "the most regressive graph in history". What everyone seems to have overlooked in the course of this choreographed entertainment was the partner to the yellow line in the IFS' presentation: the white line. Or at least everyone except Nick Clegg was conveniently hoodwinked. The Deputy Prime Minister actively grabbed at it, using it to contradict the IFS' assertive conclusions, knowing how he was the prey in their sights he attempted to use the weapon they'd provided for his defence. Almost immediately an interview with the Guardian was arranged, which he used to accuse the IFS of 'distorted nonsense'. The Guardian was the obvious title for the job as the repository of opinion formers and readers most likely to be swayed by any controversy over 'fairness'. Lifting itself up on it's legs, the story now ran. Reuters boasted 'Clegg rejects IFS austerity criticism'; The Daily Telegraph reported Nick Clegg says IFS claims poor will be hardest hit are 'nonsense'; The FT offered some balance Clegg hits back at criticism of UK cuts. And that was the friendly treatment! If you want to check through the pack of laughing hyenas in nearly 5,000 stories (so far) you are more than welcome. So although Nick Clegg was using conclusions constructed by the IFS, the IFS had pulled the rug from under his feet. The IFS may be an acknowledged expert in policy analysis, but there are many of those. The IFS has gained its' hard-won tiger stripes as a canny operator within the Westminster jungle - respect is due for its' ability to successfully bait chosen targets... and feared for it. Even by head-hunting the former top honcho at the IFS, Robert Chote, and installing him in the newly created Office of Budget Responsibility the coalition hasn't blunted the teeth of the IFS. Clegg had been manoeveured into the trap, which was now sprung. politics.co.uk wrote Clegg faces IFS 'trashing' backlash and the flurry of post-spending review opinion polls now announced LibDem support down to 10%, less than a third of the pre-election high. Perhaps he knew better, but was powerless against the magic of these dark arts - as Mehdi Hassan in the Labour-leaning New Statesman intimates Mr Clegg was happy to give self-congratulatory praise the IFS during the election leadership debates which saw him briefly become the most popular politician in the country. Some coincidence. With ironic gall Mehdi Hassan signs off, "And then our politicians wonder why the media and the public are so cynical and distrusting..."
On it rumbles, Mr Clegg looks wounded, the coalition may be teetering - even ranking hard-liners fear Labour will succeed in toppling the government. ConservativeHome took up the baton. It may not be natural territory for them but a quiver of reasons why the coalition is compassionate and good for the poor was hastily stocked, quickly increasing in number from 5 to 20 arrows. But they were distracted by gains made at the expense of their partner - as Jonathan Isaby hazily admits with a hint of disinterest, the issue does have traction. Words put in the mouths of the public confirm the pollsters conclusions that the soft underbelly of the LibDems was ripe for a hit, just as perceptions that the vulnerable and 'squeezed middle' would suffer from the 'savagery' of the deficit clawback. Finally, the till-now conveniently absent Labour leader, Ed Miliband can be watched swooping down from his eerie in order to make the kill assiduously prepared for him by his cohorts. "Instead of trashing the IFS, [Clegg] should be owning up to the truth that the spending review hits the lower and middle income families hardest." "The unedifying spectacle of Mr Clegg rubbishing the IFS will convince nobody of the government's case." If you say so Mr Miliband! Alighting from her bough as she wings her way to the rescue, Ms Flanders cuts to the chase in order to avoid being pinned down, explaining," it comes down to whether you measure the impact of spending cuts on individuals as a share of their income, or as a share of the overall benefits they receive from the state." ...in other words whether you follow the IFS' yellow line or the IFS' white line.